Context - Vaccination is one of the most cost-effective health interventions available, saving millions of people from illness, disability and death each year. Vaccines defend against infections by priming the natural defense mechanisms of the body. Vaccination has enabled us to reduce most vaccine-preventable diseases to very low levels in many countries and even, in the case of smallpox, completely eradicate it. However, some of them are still quite prevalent — even epidemic — in some parts of the world. Travellers can unknowingly bring these diseases into any country, and if the community were not protected by vaccinations, these diseases could quickly spread throughout the population, causing epidemics there. Effective and safe vaccines, which protect against a number of serious diseases, are available and many promising new vaccines are being developed2. Nevertheless, driven largely by concerns about potential side effects, there has been a shift in some parents’ attitudes toward the child immunization schedule, and vaccine hesitancy is becoming a global threat to immunization programmes. A number of concerned parents say the schedule of multiple vaccinations is too “crowded” and have requested flexibility, such as delaying one or more immunizations or having fewer shots per visit. Some parents reject the vaccines outright, arguing that the potential harm of their child suffering a side effect from the vaccine outweighs the well-documented benefits of immunizations preventing serious disease. Other parents delay or decline immunizations due to worries that family history, the child’s premature birth, or an underlying medical condition may make them more vulnerable to complications. Some just distrust the government’s decisions about the safety and benefits of childhood immunizations. 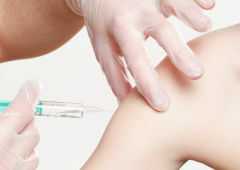 If parents worrying about children’s health and well-being, and their concerns about immunization safety can be viewed in that context, the fact is that delaying or declining vaccination has led to outbreaks of vaccine-preventable diseases such as measles and whooping cough that may jeopardize public health, particularly for people who were under- or never immunized. 2. What is a vaccine and why should children be vaccinated? After receiving the vaccine, if in the future, the virus or bacteria that cause the real disease enters the body, the immune system is prepared and responds quickly and forcefully to attack the disease-causing agent to prevent the person from getting sick. Children are given vaccines at a young age because this is when they are at highest risk of getting sick or dying if they get these diseases. From the moment they are born, babies are indeed exposed to numerous bacteria and viruses on a daily basis. They are of course immune to some diseases because they have antibodies they got from their mothers, usually before they are born but this immunity lasts only a few months and most babies do not get protective antibodies against diphtheria, whooping cough, polio, tetanus, hepatitis B from their mothers. This is why it is important to vaccinate a child before she or he is exposed to such diseases. Vaccines are given to healthy children not only to protect themselves, but also to protect the others and the communities from epidemics. In particular, a specific vaccine against the human papillomavirus (HPV) is now targeting girls before they become sexually active, in order to prevent them from acquisition of the a serious sexually transmitted infection by the HPV. 3. How effective are vaccines? The Institut national de la santé et de la recherche médicale (INSERM, France) recently published data on the efficacy of the 11 vaccines that are now mandatory in France for children3 : poliomyelitis, tetanus, diphtheria, whooping cough, measles, mumps ,rubella, hepatitis B, haemophilus meningitis influenzae b, pneumonia, meningitis and sepsis pneumococcus, meningitis and meningococcal sepsis C. According to INSERM, they protect against disease 90% or more. 4. Do vaccines cause harmful side effects, illnesses, long-term effects and even death? As stated by the World Health Organization (WHO) and based on many studies, vaccines are actually very safe, despite implications to the contrary in many anti-vaccine publications. Most vaccine adverse events are minor and temporary, such as a sore arm or mild fever. More serious adverse events occur rarely (on the order of one per thousands to one per millions of doses), and some are so rare that risk cannot be accurately assessed. According to INSERM, there is strong scientific evidence that there is no link between measles vaccination - or measles-mumps-rubella (MMR) vaccines - and inflammatory bowel disease or autism. There is evidence that the study suggesting a link between MMR vaccination and autism was a scientific fraud. Regarding vaccine safety for pregnant women, while limited data is available their vaccination may provide important benefits to themselves and/or her infant. In addition, the WHO already recommends several vaccinations during pregnancy, and some promising new ones are currently in development. 5. Why are vaccines given in combination, does it constitute a health risk? In the United States, children may receive as many as 24 immunizations by the time they turn two to protect against 11 diseases and may receive up to five injections during a single doctor’s visit. In order to reduce the number of shots a child receives in a doctor’s visit, some vaccines are offered as combination vaccines. In France, 11 vaccines are now mandatory for young children. The recommended vaccines have been shown to be as effective in combination as they are individually. Scientific data show that getting several vaccines at the same time does not cause any chronic health problems and the arguments that combined vaccines could cause "immune system depletion" are not substantiated by any scientific data. Furthermore, the argument of age invoked has no support since infants are in contact with large numbers of antigens from birth. As a matter of fact, the stimulation of the immune system induced by a vaccine is in fact negligible compared to its capacity of response, and compared to the daily stimulation by virus and bacteria, which are naturally and broadly present in their environment. The World Health Organisation (WHO) considers on this basis that the recommended vaccines are as effective in combination as they are individually, and that such combinations carry no greater risk for adverse side effects. In this context, the Center for Disease Control(CDC) in the U.S.A., and the WHO have published answers about a series of misconceptions about vaccination, which are detailed on their websites4. 6. Are there some conditions the healthcare provider should be aware of before a vaccination? It is particularly important to consider whether vaccination should be given or not to children who have weakened immune systems. This might include being sick or having a history of certain allergic or other adverse reactions to previous vaccinations or vaccine components. For example, if a child is severely allergic to eggs, because eggs are used to grow many influenza (flu) vaccines, or to latex, as some vaccines are supplied in vials or prefilled syringes that may contain natural rubber latex. There is also the responsibility to notify the doctor, local medical facility, ambulance or emergency room personnel that a child has not been fully vaccinated before medical staff has contact with your child or your family members. The WHO has published a brochure helping to understand the risks and detailing the responsibilities when it is chosen to not vaccinate a child5. 7. Are there also surveillance means to detect potential problems with existing vaccinations? After these are recommended or mandatory for infants, children or adults, in the United States, monitoring system of vaccine’s safety makes, together with the company that produces the vaccine, tests batches, make sure a vaccine is potent (it protects like it is supposed to), pure (certain unwanted ingredients used during production have been removed from the final preparation), and sterile (it doesn’t have any outside infectious germs). Mise au point de l’Inserm Décembre 2017. Que dit la science à propos des 11 vaccins qui seront obligatoires en France en 2018 pour tous les enfants ? 1 Publications of the World Health Organization are available on the WHO website or can be purchased from WHO Press, World Health Organization, 20 Avenue Appia, 1211 Geneva 27, Switzerland (tel. : +41 22 791 3264; fax: +41 22 791 4857; e-mail: bookorders (at) who.int ).